ASN.1 Editor is a tool that allows you to display, edit, format and convert ASN.1-encoded data. When I started PowerShell PKI module project, I quickly realized that I will have to deal with abstract syntax notation one (ASN.1) and distinguished encoding rules (DER) encoding subset. This is because all transferrable cryptographic objects are encoded in ASN.1 and in DER encoding. X.509 certificates, revocation lists, trust lists, OCSP, etc., etc.. While reading related literature (ASN.1 — Communication Between Heterogeneous Systems by Olivier Dubuisson) and other ad-hoc articles, I looked for a tool that would visualize ASN-encoded data to test and verify my own ASN.1 parser. There are few and almost all of them are too expensive. I used a free ASN.1 editor written by Liping Dai to reuse UI concepts only. The rest code base is completely new and is not based on original WinForms project. ASN.1 parser library. This library I wrote, is very fast and memory efficient. Graphical User Interface provided by Windows Presentation Framework (WPF) with MVVM (Model-View-ViewModel) pattern. Old tool has unacceptable slow performance. For example, it took about 7 minutes to open a 90kb certificate revocation list file. While, for my tool it is a matter of 2-3 seconds on the same hardware. Feel the difference. Very similar, so existing editor users will not face problems while using my own (if they wish to use new editor). Main features in most are the same. LenByte – specifies how many bytes are required to store length bytes (including transitional length byte). I’m not sure whether it is necessary, maybe we need more interesting data? Tree View text visualizer with decoded primitive type value. You can save this information to a file and print, if necessary. Green – this color indicates length bytes. This includes transitional byte (if any). Black – this color indicates the payload bytes. Note: node content editor applies restrictions for certain data types. For example, if you are editing numeric strict, the code verifies whether all characters in the text are valid for numeric string. You can save the selected node data into a file by right-clicking the node and selecting "Save selected node as...". Data is saved as a binary copy of the entire selected structure, including tag header and full tag payload. Paste a as a last child node of the parent. In other words, as the last node in the current level. When you operate with nodes, internal raw data and hex viewer are updated accordingly. You can save this view to a file as a text, or as a pure binary copy (converted from pasted text). Also, you can print current view. Starting with version 1.3.5, Binary Converter allows you to paste ASN string and decode it in main window. 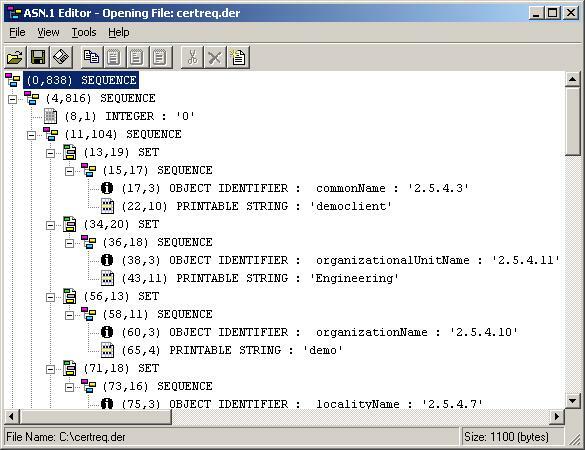 This feature allows to decode strings without having to save them in files. Tip: the code is smart enough to detect the pasted text format (or opened file content format) and is able to convert, for example, hex view with address and ASCII panes, or base64 with or without header to a raw byte array. In addition, the code correctly handles files saved in UTF-7, UTF-8, Unicode and UTF-32 encoding. Download package contains x86 and x64 binaries. The tool requires .NET framework 4.5.